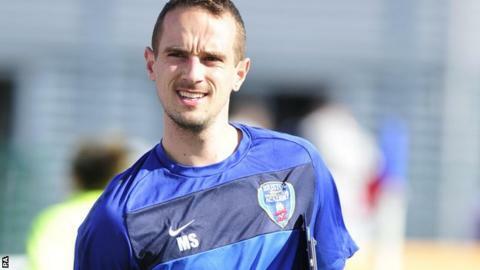 Bristol Academy manager Mark Sampson believes his age will not count against him after he emerged as a contender for the England women's manager role. The Welshman, 31, guided Bristol to second in last season's Women's Super League and an FA Cup runners-up spot. England caretaker boss Brent Hills, 59, is also on the Football Association's list of candidates. "As I say to our players, once you cross the white line, if you are good enough you are old enough," he said. "In every job I've been in, I've been asked about my age, ever since I was working with senior players at Swansea when I was 23, so that's neither here nor there. "I've shown at WSL level we can put out competitive teams, play good football and most importantly get good results. "It's about what qualities you have to offer and if they are the right person for the job, then they should be given an opportunity." Bristol are the only WSL team not affiliated to a men's side and, although they did sign a five-figure sponsorship deal with Bristol City last season, their success has come despite meagre resources compared to other teams. Hills was assistant manager to former boss Hope Powell, who left the job after 15 years in charge following the team's poor display at Euro 2013. But in a temporary role since then, Hills has overseen a perfect start to England's 2015 World Cup campaign with the team topping their group after four consecutive victories. New York Fury coach Paul Riley is thought to have been in contention, but does not have the the required A Licence qualification for the job. The FA would not confirm who was on its shortlist, but it is expected to make an announcement before the end of the year. The England team will meet for a training camp in January ahead of February's Cyprus Cup. Sampson said he would relish working with a group determined to avenge a disappointing European Championship where they finished bottom of their group despite being tipped as one of the pre-tournament favourites. "With the team and the players available, it's a great opportunity," he told BBC Sport. "All you want as a manager or a coach is a talented group of players with a hunger to do well and I think the England women's team have got that at the minute. "It's an exciting time for the game because these group of players don't come around very often. Who know what can be achieved?" Chelsea and England forward Eniola Aluko said the players had been impressed since Hills took charge. 'It's not really new but it's certainly a different style," she said. "He's a lot more relaxed and he has a lot of focus the tempo and energy of play. He's played some of the younger players in the games and they've done well." She added: "It'll be good now to hear who the new manager is going to be so we can crack on."